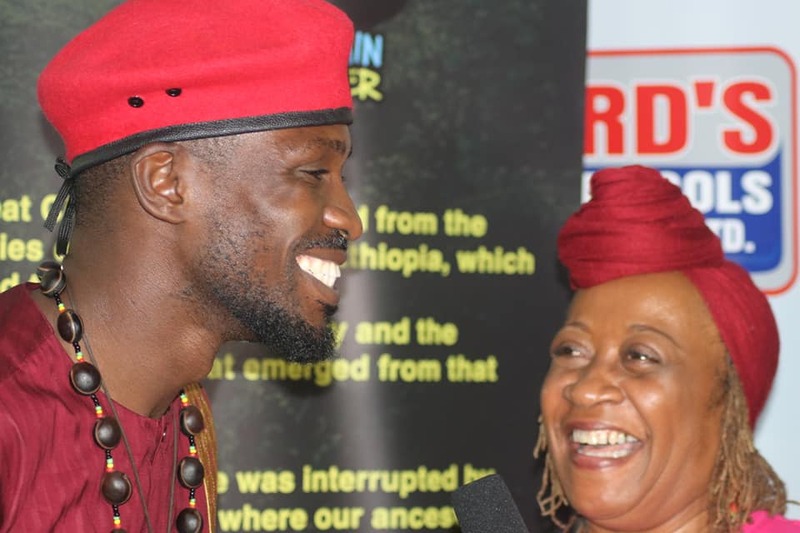 Ever since Robert Kyagulanyi commonly known as Bobi Wine stormed the political scene 2 years down the road, he has gained popularity both locally and internationally including global recognitions. However, the same People Power slogan Bobi Wine uses is being claimed by a political party named Uganda Meritocracy Party (UMP). UMP say People Power slogan is a reserved and gazetted slogan as per the laws pertaining registration of political parties attained in 2016, after registering their party. Although it’s like this, Simon Peter Ouma UMP party Acting Vice president and Spokesperson, said they have not stopped Bobi Wine from using the slogan because his interests are exactly like theirs. Adding that they are holding talks with Bobi Wine to see the way forward as far as People Power slogan is concerned. This followed earlier media reports that Balaam Barugahare an Events organiser and Promoter had registered the People Power slogan best known by many to be Bobi Wine’s political identity, as an NGO to care for the elderly. Which prompted UPM party members to issue a warning letter to Balaam and Uganda registration service bureau (URSB) against using their property, after the emergency of the news that Balaam had registered their slogan as an NGO, a report Balaam declined. “It has come to our attention that Balaam Barugahare one of the businessmen in Kampala has registered a non- government organisation in the name of People Power and has immediately threatened any individual/group who attempts to use the above name dire consequences,” a letter written by Mr Wambogo David the party acting secretary legal affairs on the 19th of January. He also said that Balaam has no monopoly over people power because it was registered by UMP and they alone bears authority over it. Relatedly, Mr Wambogo stated that Bobi Wine was cleared by UMP to use the slogan. So, they are not against Bobi Wine but Balaam the traitor. According to Wambogo no one is allowed or will be allowed to use or misuse the word people power without UMP’s authority. He continued to say that whoever has interest in the word should join UMP Party, adding that the talks between UMP and Bobi Wine are in progress and very soon the all Ugandans will be briefed on the results. UMP was founded by a group of youth, who are not yet active in the political field. They say they are laying down strategies to launch their country wide activities and there after unveil their offices, end February 2019. They continued to state that their philosophies and brochure at UMP are grounded on merit, equality, democracy, freedom, rule of law and social justice. People power slogan which is famously used by Bobi Wine during his political campaigns was first used by an Egyptian Internet activist and computer engineer Mr Wael Ghonim; popularly known to be the Keyboard freedom fighter, in 2011 pro-democracy demonstrations which ousted president Hosni Mubarak. While in his Memoir Revolution 2.0: Ghonim said power of people is greater than the people in power (2013), he proceeded to note that People Power turned around Egypt’s fortunes. And now Bobi Wine is also following the same line in his campaigns where he emphasises the power of People being much stronger than the People in power.